While American Monster Hunter fans are patiently awaiting the long-overdue release of Monster Hunter 4 on the Nintendo 3DS, they can rest assured that the Legend of Zelda bonus costumes will be making the jump across the ocean as well. Capcom confirmed at San Diego Comic-Con that you'll definitely be able to dress up your customizable character with Link's traditional green tunic, the Master Sword, and the Hylian Shield of Ocarina of Time fame. No announcements on the window of availability, but this is the first confirmation we've had that the collaboration between Capcom and Nintendo will be making it to the West. No word on the Mario or Luigi costumes either, but Capcom's Yuri Araujo states that more costumes and equipment are on the way. This collaboration was announced for MH4 in Japan a while ago and we had to keep quiet… but now that the proverbial Felyne is out of the proverbial Item Pouch, let me say this: we have more special equipment like this planned for the title. Don't ask me what they are, because I can't say, but expect more news soon! 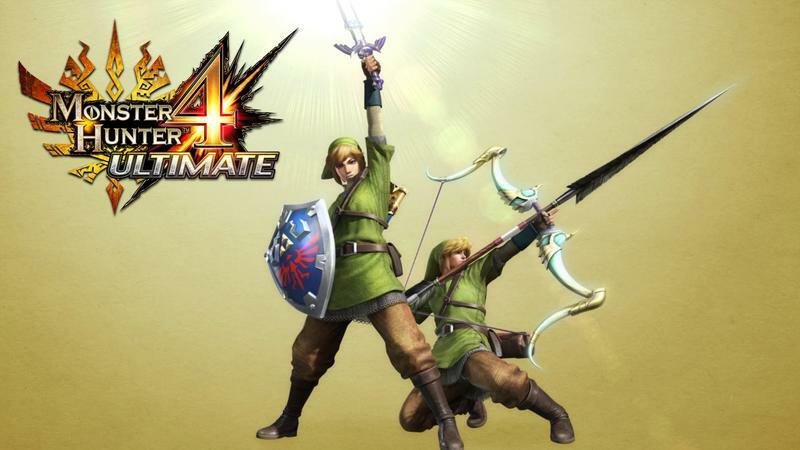 Monster Hunter 4 Ultimate will be released in America early in 2015 for the Nintendo 3DS. Does the inclusion of these costumes swing your purchasing in any way? I've only ever played the first Monster Hunter game, back when it was on home consoles and barely registering on the sales charts, back before it became the sensation it is today. Maybe Monster Hunter 4 will be a decent place to get reacquainted, especially if I'm playing in Japan.